Looking for american civil war books? Biblio.co.nz hosts hundreds of of the finest online book stores and booksellers, including specialists in american civil war. Use the list below to locate a specific specialist bookseller or book store near you. Or, use the form below to search the inventory of all booksellers who specialize in american civil war. Adamstown Books is an antiquarian and used book dealer with a retail store at the historic Lancaster Theological Seminary in Lancaster PA and a booths at an antique co-ops, German Trading Post, in Adamstown PA. Our presence began in Adamstown, aka America's Antiques Capital. The Adamstown tradition is boosted by our proximity to the emerging antiques presence in Columbia PA, and the rich religious and cultural history of Lancaster County and Pennsylvania. With Gettysburg a 1 1/2 hour drive away, the American Civil War is naturally one of our key categories. We also offer a growing number of Religious and Theological works as a result of our partnership with the Lancaster Theological Seminary. We specialize in books and CD-ROMS on the American Civil War, featuring more than 2,000 regimental histories. Seller of American history non fiction, fiction. Specialize in American Civil War. Biography and non fiction. Signed first editions available.We attempt to tell the Story Behind the Story. With a signed or inscribed book we attempt to determine the ownership of the book. Handyside Books has returned inscribed books to the family of the original owners. A set of Freemans' Washington found at a flea market was returned to the owners. The owners had mistakenly given the books to Goodwill and they ended up at the flea market. A civil war book by Wilkinson was returned to the family. Dated inscriptions can provide details as to what the author was doing on a particular date. The Story Behind the Story. 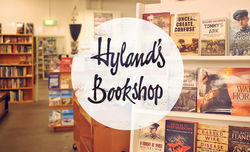 Established in 1965, Hyland'sis a specialist bookshop with an unsurpassed range of books on military history, aviation, naval and maritime history.You’ll also find books on railway and transport history, mountaineering, hunting, shooting and associated videos. In fact, with over 22,000 books on shelf, there’s bound to be a book to suit every history and transport reader.We are now located a large first floor , retired movie theatre in MidCity Arcade, 200 Bourke street.We welcome keen visitors and history buffs alike. I Cannot Live Without Books sells both new and "gently read" books. Our areas of specialization are American history, American Civil War, World War II, biographies, and mysteries. INVENTORY covers all varieties of Military History: American, British, European. All time periods, but predominantly 19th & 20th Centuries. Also reference works on small arms, artillery, aircraft, warships, uniforms etc. Catalogues of new inventory issued periodically: to subscribed send me a request by e mail. Established in 1990, we have over 20,000 military & history titles in stock. Mail order only unless by prior arrangement. Visit our website at www.paulmeekins.co.uk for further listings and details of bookfairs and other shows which we attend. My name is Michael Wise, and I am the proprietor of The Civil War Book Shop. I have been a Civil War buff since grade school, and enjoy visiting battle fields, reading about the war, and discussing it with friends. I am an avid reader, and enjoy browsing through book stores, making that special find and racing home to read it. For several years I have taken advantage of ordering books online, enjoying the convenience of door step delivery. After much research, I determined there is room for an internet book retailer devoted to the serious Civil War reader, collector, and history buff. For nearly five years The Civil War Book Shop has offered a select line of new, used, and collectible books. Along with American Civil War related books, we also offer items in categories such as Early American History, Native American, World War II, Other Wars, Business, Human Interest, Religion, Cooking, Gardening, Quilting, etc. These items are those that capture my interest (and my wife\'s) and that I think may interest others. I try to add new items each week, so check our store front often. My goal is to provide customers with the level of value, service, and convenience for which only the finest traditional, independent retailers are known.